Sometimes your Angular application needs to be a little bit different depending on the environment. Maybe your local development build has some API services stubbed out. Or you have two production destinations with a little bit different behavior. Or you have some other build-time configuration or feature toggles. The differences can be on any level: services, components, suites of ngrx/effects, or entire modules. The dependency injection and module mechanism in Angular is pretty basic, and it does not seem to offer much to answer such use cases. If you want to use ahead-of-time (AOT) compilation (and you should! ), you can’t just put random functions in module definition. I found a solution for doing it one service at a time, but it’s pretty ugly and not flexible enough. The problem does not at all seem uncommon to me, though, so I wanted to describe a nice little trick to work around this. Let’s study this on a sample app. To keep things interesting, let’s make a realistic simulator of various organization hierarchies. Playground, where little Steve would really like to own the place… except that he can only do that when the local bully is not around, and that’s only when he’s eating. To determine the ruler we need to ask the Bully’s mother about his status. So it goes. Wild West, where the rules are much simpler in comparison: It’s sheriff who runs the show, period. So, how to achieve that? The solution is actually pretty straightforward. All it takes is a little abuse (?) of Angular CLI environments. Long story short, this mechanism provides different environment file to the compiler based on a compile-time flag. If you check the documentation or pretty much any existing examples, the environments are typically used to provide different configuration. Just a single object with a bunch of properties. You might be tempted to use it in some functions on module definition, but it’s not probably not going to work with AOT. Oops. However, at the end of the day it’s just a simple file substitution. You can put whatever you like in the file, and as long as it compiles everything is going to be OK. Classes. Exports from other files. Anything. 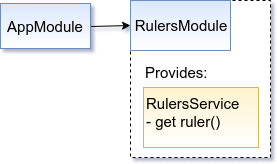 In our case, the AppModule can import the RulersModule from the environment. It doesn’t care much what the module actually contains. The environments would export it from the relevant “package”. They could have the classes inline, but I prefer to keep them in separate files closer to the application. The final trick that makes these work is that there is an abstract class/interface for the RulersService, and AppComponent (or other services, if we had them) only depends on that. Actually, this pattern has been around for a while. This is the old good programming to interfaces. The same goes for the RulersModule: In a sense it’s abstract too, AppModule doesn’t know or care what concrete class it is. As long as the symbol with the same name exists during compilation. This sample demonstrates it on the module level, but you can use the same trick for any TypeScript code, be it a component, a service, etc. I am not sure if such use of environments is ingenious, or insane and abusive. I have not seen this anywhere. However, it does solve a real problem that does not seem to have a solution in the Angular toolbox (and it’s not particularly toxic). Check out this sample app at my GitHub repository.